In this week's Wednesday Werk, we'll look at the Xilmpa. The Xilmpa are a conquering, warrior race of crocodilian humanoids. Horror, disease, and destruction follow in their wake, but the reasons are unclear. Some scholars seem to think they are cursed, while others believe they are infected with the raw soulstuff of the Elemental Chaos. Partial credit. The Xilmpa are known to enslave those they conquer for use in their mining operations, as their desire for rare minerals is insatiable. Oddly, reports suggest they eat these materials. For strength. In fact, reports filter back from blasted wastes and ancient mines that the creatures ignore silver and gold, instead mining and eating a silvery-grey metal sometimes called the Dross of the Sun God, but also known as the Excrement of Pelor. Some claim the strange metal gives the creatures their strength. Others suggest they're addicted to it. Still others say they need it to survive. Some say all these things are true. Supposedly, a group of Xilmpa are mobilizing. Even now, those in the know have offered a large bounty for any who can stop their quest, for the creatures supposedly seek an ancient holy site known as the Sun's Kingdom on Earth. If they find it, they may be unstoppable. In combat, the Xilmpa are efficient hunters. They typically open with Geislun Auga, attempting to irradiate and weaken opponents before wading into melee. They attack efficiently and make optimal use of group tactics; if several can surround one opponent, they will typically try to stack as many status effects as possible on that opponent to deal maximum damage. If that is not possible, Claw is a favored attack as it deals a little extra damage. DMs without access to Gamma World should assume that radiation damage is a unique damage keyword only found on things that are, well, radioactive. Radiation damage is probably only a hazard in uranium mines, natural nuclear fission reactors, and the like (I recently updated Expedition to the Barrier Peaks to 4e, and included radiation damage there, too). It is best described as a combination of disease, necrotic, poison, and radiant, but it is truthfully none of these. 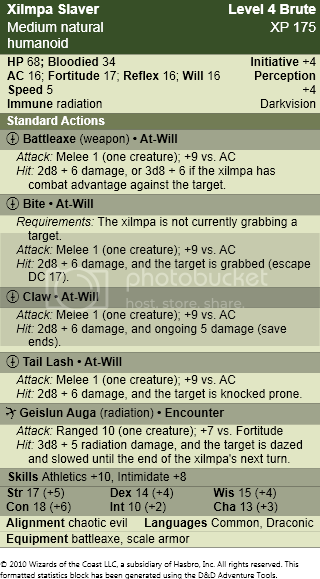 Adventurers are only likely to encounter it with regard to the Xilmpa, and so probably will not have resistances or vulnerabilities to radiation, nor will they deal radiation damage; it simply allows the Xilmpa to persist in toxic environments of the DM's devising. Additionally, enterprising DMs can create mutant Xilmpa strains in the same method as mutant Almas strains, as described in this Wednesday Werk post. Simply swap out Geilsun Auga (actually a reskinned Das Gamma Auge Alpha Mutation) for another Alpha Mutation and you're ready to go.